– Cut and prepare beef, garlic, onion, celery, and carrots. – Season beef with salt and black pepper. – Heat oil on high and brown beef well. – Add garlic, onion, celery, and carrots, saute until vegetables are tender. – Add Red Wine, bay leaves, thyme, coriander, black pepper. – Reduce wine for 2 minutes. – Add broth and potatoes, bring to a boil. – Reduce heat to a medium-low heat for 30-40 minutes until beef is tender. – Remove thyme and bay leaves before serving. 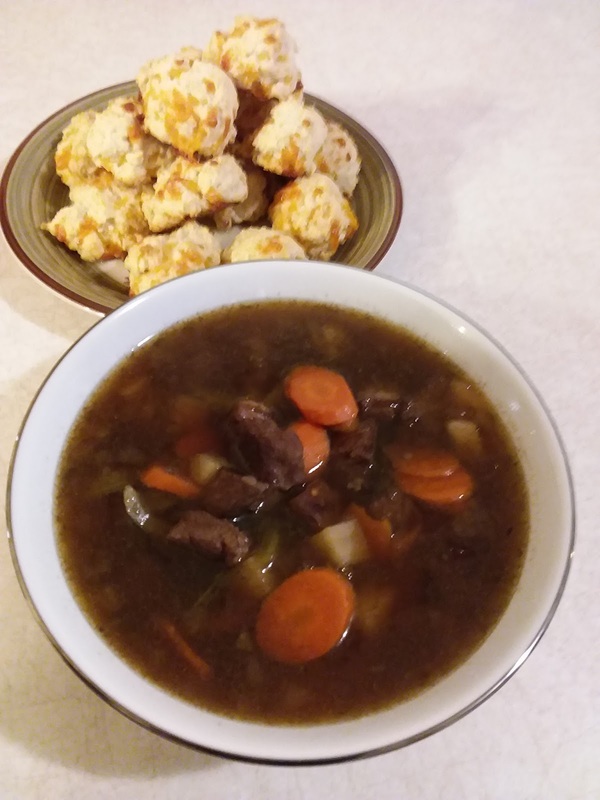 Biscuits are great to serve along with this soup. Professional chef, Mark, and his girlfriend,Annarose, have used their culinary expertise and love of eating delicious and nutritious foods to create, develop, and share these recipes that are sure to become some of your favorites, too. I have found their emphasis on wholesome and healthy ingredients… and cooking tips, create recipes that are intriguing, easy to follow, and tasty! Definitely give them a try. Comments by an avid fan…and fellow chef.